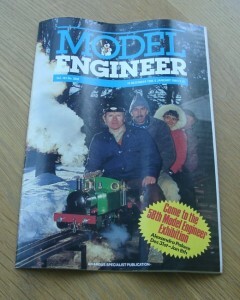 Vol 161 #3839 16th December 1988 of the British Magazine, Model Engineer. Features in this issue includes Building a rotary table (part 1), Living with a Hobbymat – one man’s experiences (part 2), Aeolus – a model steam driven blowing fan (part 2), Nigel Minor – G.N.R. 2-8-0 class 01 locomotive for 2 1/2 in. gauge (part 9), Cowell’s Capstan – repetition aid for a miniature lathe (part 1), Making Tracks – ground level permanent way (part 5), Cranes – one man’s enthusiasm (part 3), Wheel Quartering made easy – handy hints, Charles – finishing touches (part 3), and the 58th Model Engineer Exhibition.